NORTH TONAWANDA – It’s easy to find Project 308 Gallery – named for its address on Oliver Street. The new gallery started as a project, quite literally a University at Buffalo art project, and has grown over the past year and a half into an in-demand space for artists both beginning and established. At age 26, gallery owner Natalie Brown has thrown herself headfirst into creating the space. Until 2012, the gallery was a vacant, rundown storage space in a building owned by her father, Paul Brown. She said she took it upon herself to clean up and restore the site, tearing down paneling and drop ceilings, and finding interesting treasures underneath, such as decorative tin ceilings, which she painted gold, and cement walls and exposed pipes, which she painted white to create an open space for art displays. Hardwood floors provide a nice, rich contrast that does not distract from the displays, while storefront windows let light in and also allow passers-by to peek in and see the art as they walk by. Brown, who was born and raised in North Tonawanda, graduated from North Tonawanda High School in 2006. 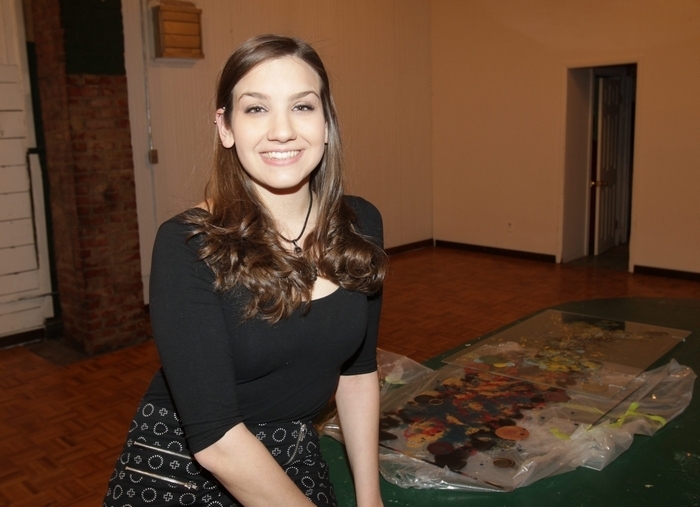 She has a master’s degree in art history with a specialization in museum studies from the University at Buffalo. Currently, she works full time as a paralegal for Legal Services for the Elderly, Disabled and Disadvantaged, a nonprofit, but she said her dream for the future would be to make Project 308 Gallery her full-time job. “I know I want to continue having shows and exposing emerging artists. I want people to have a chance to show their artwork at a flexible rate. I just want to give artists that experience and a chance to sell their work too,” she said. Coming up, the gallery will feature the work of Matthew Palmo in a show titled “IndicatorArt,” with an opening reception from 7 to 10 p.m. April 11. His vibrant, colorful oil-on-canvas pieces will be on display through April 30. In May, the Kenmore Art Society will have its group exhibition at the gallery. Tell me how Project 308 Gallery got started. I’ve always had a background in art history and museums. I am especially interested in museums. For one of my projects (at UB), I took a class called “Buffalo the 1970s,” and we could either write a paper or do a project for the semester. And, typical me, I did a project. They said you could do a project inspired by the 1970s, especially in Buffalo. The big thing at that time was artists building or making their own galleries – it was a brand-new idea. So I started looking for a space to do a mock gallery or a fake gallery, and I’d write a paper about it. How did you end up here on Oliver Street? My dad owns this building, and it was in tremendous disrepair. But I kind of used it as: What it would be like if I did have a gallery. My teacher said, “Why don’t you really do it?” And then it turned into a big project. That’s where I got the name of the gallery too. It sounds like a full-time job here. But you have a 9-to-5 job as well right? I work full time 9-5, Monday through Friday, but I work here nights and weekends and whenever I can. We are open on Tuesdays from 7 to 9 p.m. and Saturdays from 1 to 5 p.m. That’s all I can handle right now. I’m here all the time, but those are my official hours. We usually have openings on Friday nights and Saturday nights. Has the art community been supportive? Yes. The word of mouth in the art community runs really fast, so after four months of being open, artists were calling me. Right now I am booked until the end of June. People love to have shows, and once they find a new space in town, they call me right away. What about in North Tonawanda? In North Tonawanda alone, the art community is amazing. We have the Carnegie, which is a great historical place, and now it has all those renovations, and they just got a grant to fix up the building. The River Art Gallery is sprucing up their deal because Partners in Art closed, and I think the River Art Gallery is going in there. In just an eight-block radius you have three chances to see art. It can be traditional, though mine’s a bit more modern and untraditional, and the River Art is a little bit of both. Just in North Tonawanda we have so many opportunities. I don’t think people always realize there’s so much art here. Last summer we all worked together and put on an art walk. If you walked to each gallery, or drove, you got your passport stamped and then got a free dessert at Webster’s Bistro. That was super fun, and I got a lot of new faces in here. The owners of the other museums are great, and they keep me involved too. Are you an artist too? I just dabble. I am more crafty. It’s just a hobby. I would never have a show of my artwork. So I guess you would be described more as an organizer. Yes, organizer, curator, promoter. The gallery is my artwork in a way. I think when I got started, I didn’t know what I was getting myself into. I just knew that I wanted to have shows, and I wanted to have artists here. But once I got serious, I found I really enjoyed it. Who is typically using your space? It’s been a mix. At first I was getting a lot of students. If they go to school for fine arts or design, they have to have a senior thesis show. So at first it was a lot of young emerging artists, and now I am really getting more professional artists who delve into their niche. I feel like it’s getting more serious. Do you do other things besides art shows in the gallery? We used to do dance classes, but we don’t do that any more since the teacher moved. We just got done with our kids’ art classes and may do another session of that. We did a terrarium workshop. We had a hula hoop party. I will do anything if a teacher or somebody wants to teach here or rent out the space – I am open to that. It’s great for many functions. Art gallery owner and paralegal. Aren’t those jobs pretty far apart? I do a lot of outreach programs (for the legal services office). I actually met my supervisor, the attorney there, through the gallery. She liked the way I did events here, and they wanted to do more outreach. Is it tough trying to run a gallery while working full time? It’s tough, especially at first, but now I am getting the hang of it. I have more energy. I am used to getting up early and being here late at night. The gallery is very nice. Did you fix it up yourself? Yes. It went through a very extreme makeover in May or April of 2012. It took me three or four months. I had to gut the whole place. There was tile ceiling below the tin ceiling, so I took that down, and I found the tin ceiling, which used to be beige. I painted that gold. That wall (she says, pointing across the room) had three walls on it that I took down. This wall had 1970s wood paneling. It was just a disaster. It’s still an ongoing thing. I am always trying to improve. There’s a couple of back rooms that I am trying to make into an office. How do you feel about the city’s plan’s to fix up Oliver Street, providing matching state grant funds? I think it’s very exciting. I know that other business owners on this street are excited too. And I know we have the motivation to do it. It is an older street. I know it’s going to take time. I’ve talked to business owners on Webster Street, and it took at least 10 years to get where they are. If we are here now, when it’s rundown, then it can only go up from here.